Prof. Dr. Andreas Dietrich of the Lucerne University of Applied Sciences and Arts, Simon Amrein, Reto Wernli and Dr. Falk Kohlmann have published the study ‘Crowdfunding Monitoring Switzerland 2015‘. It analyses the development of crowdfunding in Switzerland giving special attention to the development of p2p lending. The Swiss market is growing fast; albeit on low absolute numbers compared to other European countries. The market is in a very early development stage. As the following chart shows the volume is mainly generated by crowdsupporting/crowddonating. The crowdlending market has experienced the strongest year-on-year growth of all crowdfunding segments. … The number of campaigns rose from 116 to 214, and all of them were successfully funded. The current challenge of crowdlending platforms is not finding funders. On the contrary, it is (more) difficult to get borrowers on the platforms. 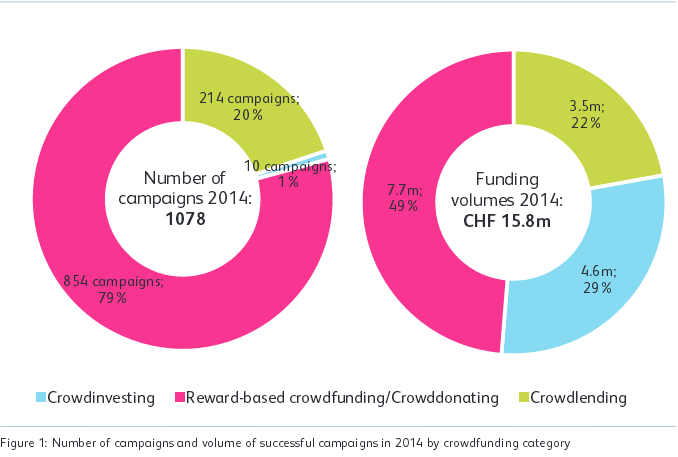 Crowdlending campaign funders invested an average of CHF 1,100, which is substantially different from the figures in reward-based crowdfunding & crowddonating as well as in crowdinvesting. The average campaign amount was CHF 16,200, which was slightly higher than in the past year (CHF 15,000). The average loan amount in crowdlending is very similar to the average consumer loan as of the end of 2014. The crowdlending market is, however, still niche market. Regulation limits that a private consumer loan cannot be financed by more than 20 different individual lenders. The average borrower age is 38. One fifth had at least one child under the age of 16 at the time the loan was raised. At 37 percent, married people were proportionally under-represented, although they make up 54 percent of the permanent resident population. 19 Homeowners (19 percent) and women (24 percent) are also under-represented. The distribution of nationalities is slightly more representative of the Swiss population. 71 percent of the borrowers were Swiss, while 29 percent of the borrowers were not in possession of a Swiss passport. The average proportion of the foreign-born resident population in Switzerland was 22 percent between 2008 and 2013. The age distribution of the borrowers leads to the conclusion that crowdlending is currently still primarily used by the tech-savvy Generation Y. 60 percent of all loans raised since 2008 went to people under the age of 40. Only 4 percent of the borrowers for successful projects were over 60 years of age. Also the borrowers regional distribution shows that use is much more common in the German speaking areas of Switzerland. 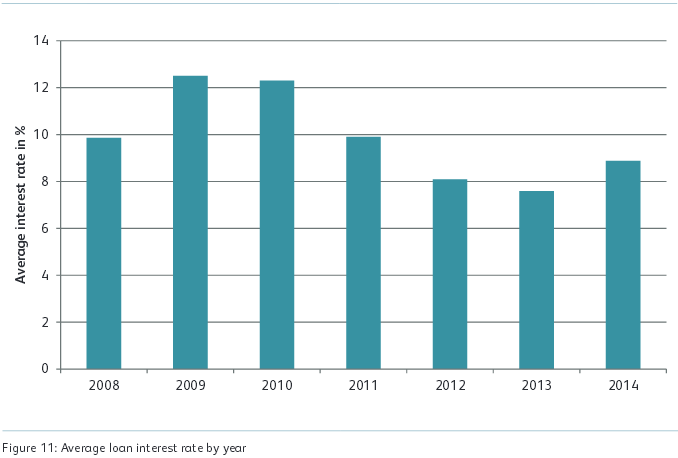 Half of the loans originated in 2014 had interest rated between 7.7 and 9.9%. The interest rate dispersion has declined over the years. Borrowers living alone pay one percent lower interest rates than cohabitants or single parents. Borrowers that are homeowners pay 0.6% less in interest than tenants. Swiss citizens also pay less interest in comparison to foreign nationals. The average difference is 0.5 percent. Women pay slightly higher interest rates. However, this is probably less due to gender-specific differences than to the fact that women had 30 percent lower net income in comparison to male borrowers in the data set. Significant differences were also found with regard to the characteristics of the loans. Longer terms bring up the interest rate by around half a percent per year of the term. The authors see a high potential for the Swiss p2p lending market. They find that the low default rates so far and the relatively high returns have led to a strong investor demand that currently is not matched by borrower demand. As a consequence certain loans are funded in almost no time at all and interest rates in the auctions have decreased over the past years.